Zing! 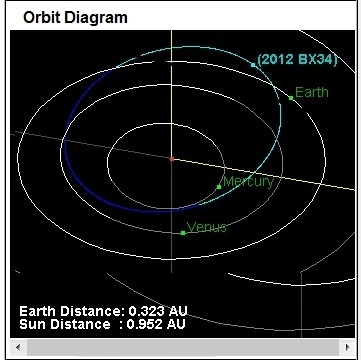 Asteroid 2012 BX34 has just skipped by Earth, coming within 30,000 miles. That’s only 0.17 Lunar Orbit distance. Pretty close shave. Meanwhile, it’s a heck of a lot of fun to play with the NASA three dimensional orbit viewer, which animates our solar system by a selection of speeds and centers. Check out the stately, serene view from Neptune, as the inner planets, like Earth, spin like hyperactive dervishes next to the sun.